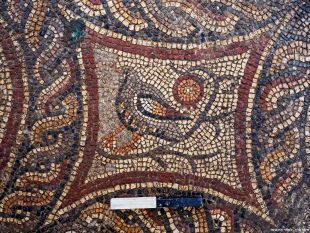 Another spectacular mosaic has been found in the city of Lod while doing groundworks for a museum to house the spectacular mosaics already found there in previous years. 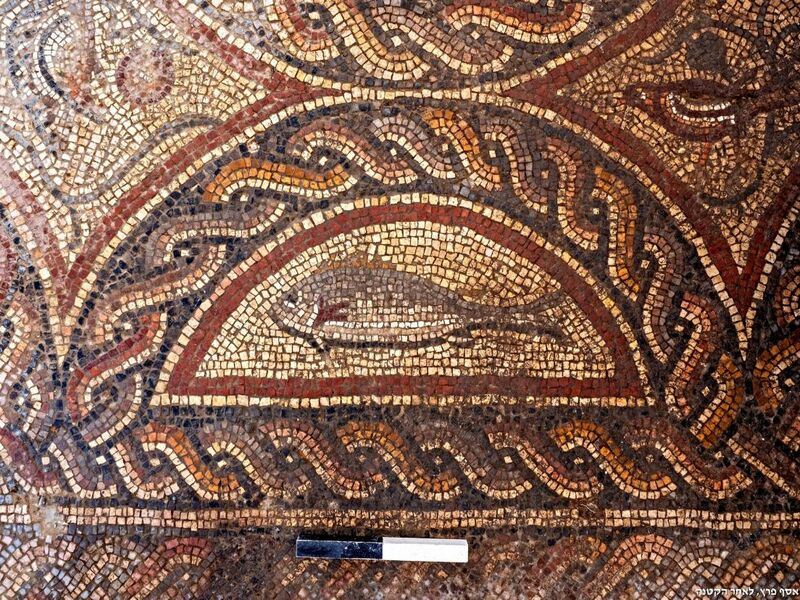 The mosaic was found in a late Roman-era house dating to about 1,700 years ago. The sheer quality of the stonework indicates the owner was extravagantly wealthy. 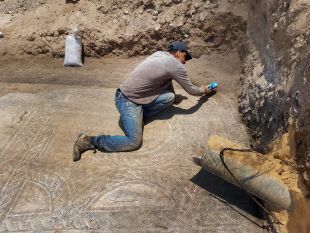 “The villa included a large, luxurious mosaic-paved reception room triclinium and an internal columned courtyard, also with mosaics, and a water system,” says archaeologist Amir Gorzalczany, the director of the present excavation. In fact, this is the third mosaic discovery in this structure – which, in embarrassing contrast to modern construction, seems to have existed for centuries. The archaeological find indicates the house survived in one form or another from the Roman era – the first century – to the late Roman era, around the late third century or early fourth, says Gorzalczany. Based on other Roman-era homes found in the area, which also had mosaic decorations, it appears that this luxurious manse of yore had been in the elite neighborhood of Roman-era Lod, he says. The Israel Antiquities Authority excavators also found Roman-era coins, ceramics and marbles, as well as other signs of luxury such as fragments from frescoes typical of the finer houses of Rome itself. To whom might this lovely domicile have belonged? 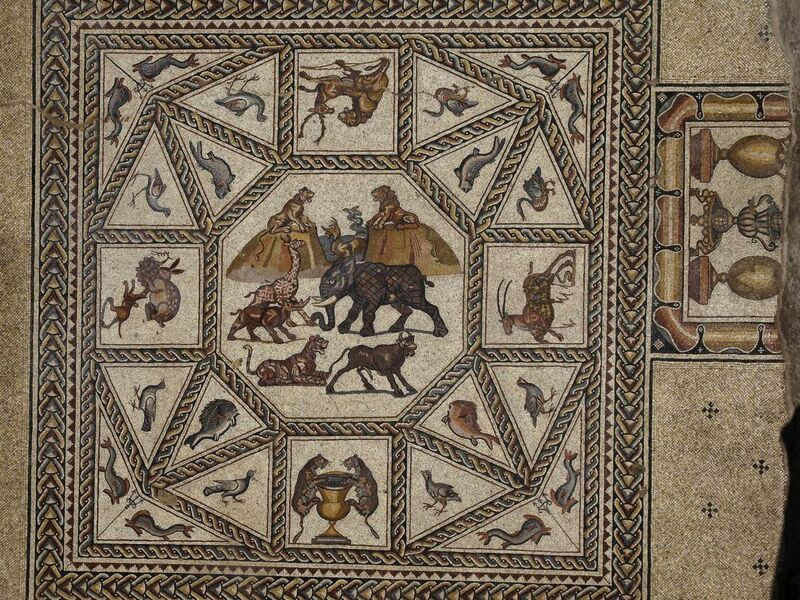 The newfound mosaic depicts nothing but animals and nature. No people. But it has a motif of three fish in the middle – all of which boils down to nothing concrete, Gorzalczany clarifies. One theory could be that the inhabitants had been Jews who eschewed the human figure in art due to divine prohibition. 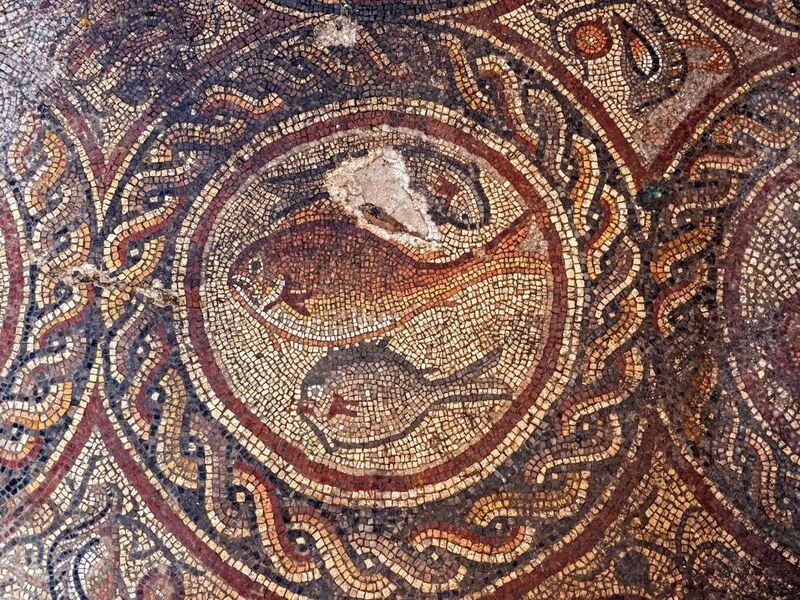 Or maybe the house belonged to early Christians, based on the fish representation of the religion – but no other artifacts typical of Christian faith have been discovered there, Gorzalczany points out. Or maybe the owners were pagans, clinging to the ancient Roman beliefs. Whoever made this mosaic needed great tiling skills – which begs the thought that it was the same person who made a strikingly similar high-quality mosaic found on Mount Zion in Jerusalem. It also depicts very similar animals and geometric patterns. But instead of the three fish in the middle, the Mount Zion mosaic features the goddess Gaia. At least that is what we call her 2,000 years later. Then she was called “Ge” in Greek, from which the word “geography” would arise, Gorzalczany says. The Lod mosaics were first found in 1996. In what’s becoming a cliché in Israeli archaeology, the initial discovery was made by construction workers, in this case building a sewage system, supervised – as is the norm in Israel – by archaeologists. Somebody noticed a bit of colorful stone. “It was a total surprise,” Gorzalczany recounts. So was the quality of the work, so extraordinary that the mosaic with its animal motifs has been taken around the world for exhibition. That was in 1996. 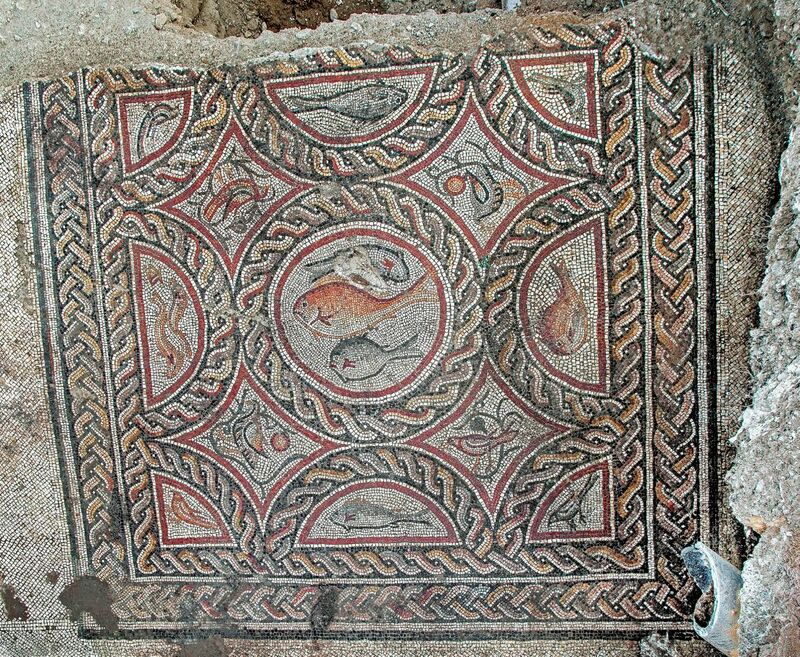 Then, in 2014, excavators found another mosaic in what had been the courtyard of the house. Digging it up, the archaeologists could see the corner of yet another one peeping. But they couldn’t get at it because it was under the neighborhood parking lot. Given that it is smack in the middle of land used by Lod’s modern residents, this new one had to be quickly conserved, rolled up as one does with 1,700-year-old mosaic floor decorations, and moved..
Back when the excavators noticed the corner of the “new” mosaic peeping from under the parking lot, they thought they had found the bedrooms of the ancient mansion. They had not, they realized, going on rectangular marks on the floor that seem to show where couches had once been placed for the feasting elites to recline. In short, they think they found a secondary reception or banqueting hall. In other words, the house was grander than originally thought and they haven’t found the bedrooms yet, which could have been on a second story – in which case they won’t be found. At this stage, the mosaic has been rolled up and taken away for painstaking preservation works by the antiquities authority. “They’ll put all the stones back and strengthen and clean it,” says Gorzalczany, “working like doctors with scalpels, one stone at a time.” Eventually, presumably, it will be housed in the future Lod archaeological museum, to be called the Shelby White and Leon Levy Lod Mosaic Center, which is going up about where it had been found in the first place.